Great Christmas weekend and Christmas Feasting with family. Unfortunately...none of them share my passions. So...after checking river levels this AM I headed out. Air 36F beautifully crisp day with calm winds and a little sun. Water temp was 40F and the river had fallen and cleared nicely to where I could fish shoreline eddies. Started this AM with what's called the "Hare's Delight." 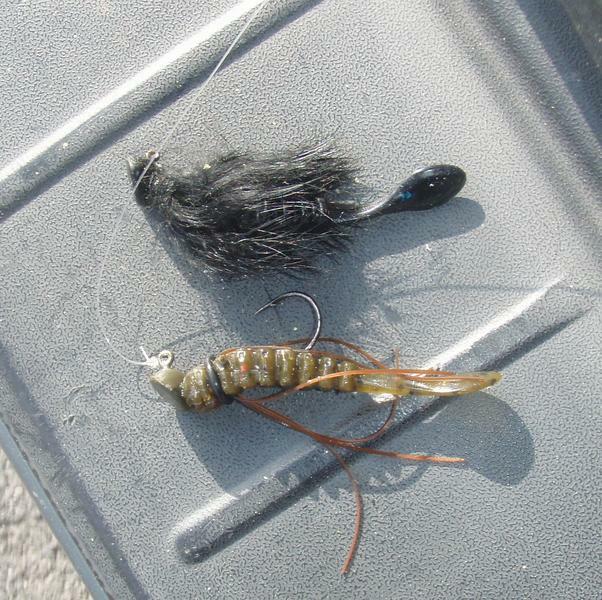 It is a crosscut rabbit hair jig designed on the "Willie Wannabe". This picture shows the Hare's Delight and the Willie Wannabe...only difference is the rabbit fur. Really looks "cool" in the water. First cast and I had a dandy hit. When I set the hook I imagined my quest for the 5 lb. smallmouth was over. Then my smallmouth vision took off for the current and when I brought it back it started rolling and rolling. Not a smallmouth. Maybe a channel cat or musky. After the rolling and spinning it went limp and came in rather easily. 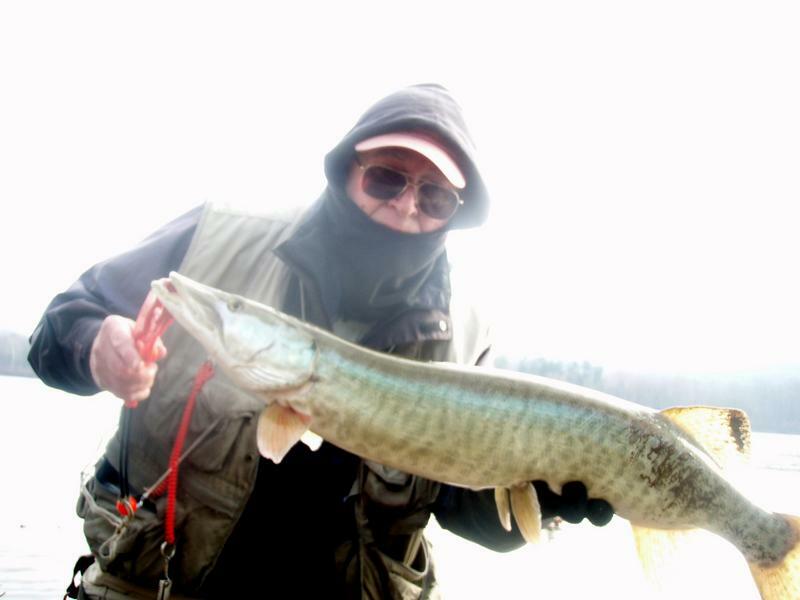 Over the years I have had several muskies that wrap the line around their gill plates...and if it doesn't cut the line it partially asphyxiates the fish because they cannot breath. That's what happened today. The Hare's Delight was caught right at the tip of the upper jaw and my 6 pound test line was wrapped around the gill covers. 32 inches and a little over 8 lbs. 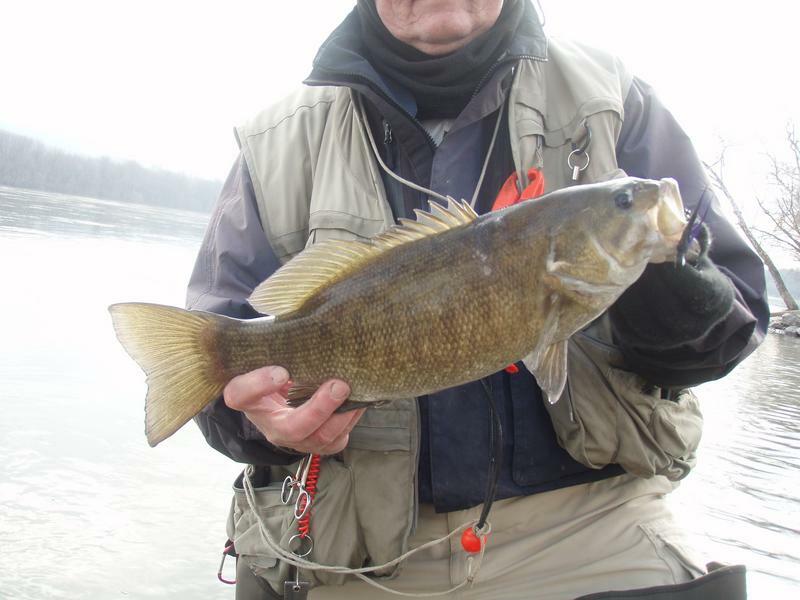 The smallies were tight-lipped and still confused from the high water but the Hare's Delight did entice this nice 3 pounder. Stay tuned...still looking for that 5 pound smallmouth. Glad you could get out, thanks for sharing! Is the O-ring on the Willie Wannabe to hold the silicone on the bait? ...Is the O-ring on the Willie Wannabe to hold the silicone on the bait? The silicone strands pass through the trailer from top to bottom...there is little problem with them coming out. The stand up jig used with this trailer has a dual barb on the collar and I think the o-ring is there to help keep the plastic trailer on the jig so the fish doesn't strip it off...it is a rather small plastic trailer and the o-ring slides over the barbed collar helping to secure it. At least that's what I assume is its function.